I’ve joined the wondrous global Art Therapy + Happiness community. Create an Introduction Wheel, featuring the four Cs in four quadrants. The four Cs? Courage, Compassion, Connection, Contribution. Right up my alley. The four Cs mean a lot to me. I spend days pondering how I might portray them. I itch to get to my art-making. Finally! I carve out time and space. I ignore my list of Tasks-To-Do-Now-Or-Your-Life-Will-Topple-Over. I am at play. A little spiral painting on calico catches my eye. I did it spontaneously in my creativity support group. It’s one of those pleasurable, non-thinking pieces – a spiral with a baby spiral growing off it. It’s perfect for the job, in an embarrassing, radical, totally non-wheel, non-quadrant sort of way. I write in the four Cs. I tell a friend about the AT + Happiness Project. It might not be a real proper wheel with real proper segments, but I allow Courage, Compassion, Connection, Contribution to flow in the organic spiral of giving and receiving – the Creative Love Exchange. And here’s a link to further explain the Creative Love Exchange. Can you let yourself follow your creative impulses regardless of what that persnickety Inner Critic says? 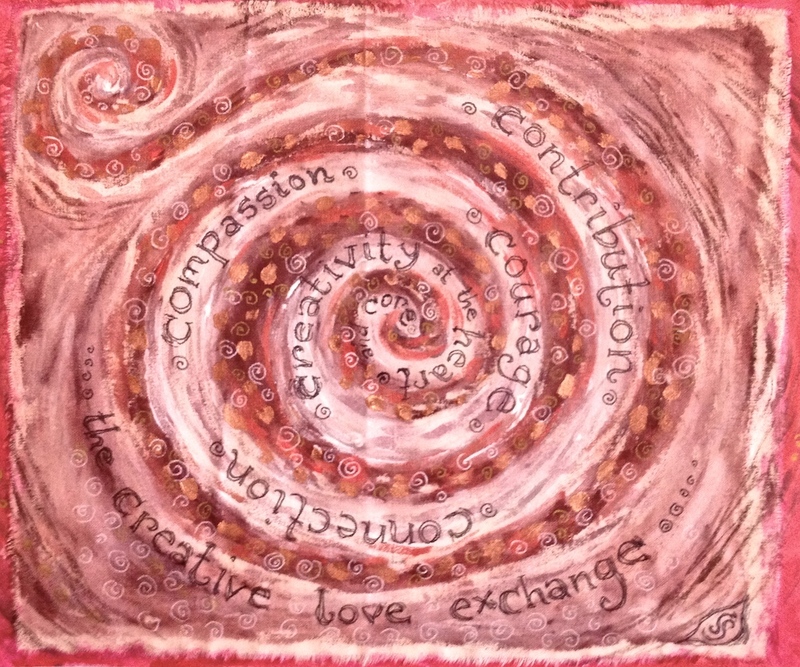 This entry was posted in creative love exchange, Seeds and Snippets and tagged Art Therapy + Happiness, courage to create, Creative Love Exchange, painting, spiral by Art and Soul Space. Bookmark the permalink.